The basic essence of wild camping entails seeking out wilderness experiences away from official campgrounds. While actual ‘hiding’ isn’t usually necessary unlike stealth or guerrilla camping that tend to be undertaken in more urban environments, it is still important to keep a relatively low profile. 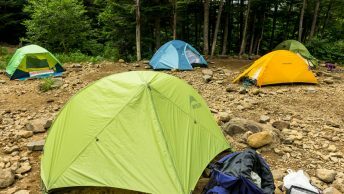 Different countries, states and territories all have their own rules and regulations when it comes to wild camping in National Parks and Forest Service lands so check with the relevant land agency to be safe. In Japan camping outside of designated campsites in either Quasi-National Parks (kokutei-kouen) or National Parks (kokuritsu-kouen) is highly discouraged. Wherever possible stick to proper campsites to reduce your impact on the environment. In high trafficked spots or areas of pristine nature such as Oze / Kamikochi you’ll swiftly be given your marching orders if detected and rightly so. Having said that if you’re in a pinch and pay heed to the principles below it may be possible. Wikitravel also has a good article on urban camping in Japan which I recommend checking out. Provided you’re discreet it’s possible to camp in quiet parks outside the downtown. The crucial element is being respectful towards nature. Most of these remote campsites we seek out are not marked on maps, have never been camped on before and as such need to be treated with due care and respect. I guess the first and foremost rule of wild camping is always leaving your site as pristine as you found it. Key to enjoying a wild camping experience is knowing where to pitch. Ideally find somewhere flat and dry, preferably 30 minutes from designated campsites. Don’t pitch your tent right away instead scout for suitable sites that provide protection from the wind, away from cold air pockets and be mindful of widowmakers in enclosed areas. Even if you’re familiar with the area, there’s nothing wrong with asking for a little friendly advice as to where might be a better spot to camp. Most folk are usually in the same situation and are happy to offer some insights. Not vital but camping close to a water hole is convenient and means you won’t have to go rummaging for one later. Run with a green or earth toned tent to better fit with the surroundings such as this MSR. For further concealment and lightweight versatility consider sleeping with a standalone mattress and bivvy sack. Stay well clear of dry riverbeds no matter how tempting they may appear and camp up high after negotiating any rivers you may need to cross. Whilst you don’t want to be setting up camp in the dark you want to ensure its late enough in the day that most hikers have moved on. Likewise don’t linger around in the morning waiting to be disturbed. In the instance your covert location is stumbled upon you may very well find yourself being asked to move on. Things happens, rather than argue the point find another site further away from potential trouble. Don’t trespass or camp on private property without special permission. Consider cooking some distance away from the intended campsite especially in bear country where you should cook at least 200 metres away from your tent. Hang your food if you suspect animals in the area. Unless absolutely necessary its best not to light a campfire, as apart from leaving a scar on the landscape you risk burning down your tent or worse. Carry a lightweight stove for cooking. In a similar vain to lighting campfires, don’t play music or do anything else which is likely to draw attention to yourself or potentially annoy those around you. During the evening avoid using your headlamp for long periods as it may reveal your whereabouts if you’re wishing to maintain a low profile. For your morning ablutions maintain at least 50 – 100 metres away from water sources, trails and your campsite. Use a trowel to dig at least a 6 inch deep hole and fill it in sufficiently before leaving. In situations where you might find yourself sick or injured ensure you carry a fully charged phone, GPS, whistle, mirror or signalling flare to attract attention. Goes without saying but ideally you want to leave your wild camping site as pristine as you found it. Replace stones and logs as you found them. Before heading out double check to make sure no rubbish or food scraps are left behind. Like any backcountry outing play the safety card first, ensure a map and itinerary is left with a family member or friend. Last of all embrace the unique freedom that comes with wild camping, the chance to camp in little explored spots is one of the wonderful things about backcountry exploration. The more you do it, the more self-reliance you will build, allowing you to relax and enjoy those moments spent outdoors. Can you recommend which of your hikes on your site are suitable for wild camping? The ones I would recommend for wild camping are Mt. Daibosatsu, Mt. Takanosu, Mt. Okuratakamaru and Mt. Buko. Have a look at the trail write-ups for those hikes as they all have water holes in areas which are reasonably secluded. The wild camping tips is popular and useful it is very essential.